Truly Bookish: Black History Month Giveaway Hop! Black History Month Giveaway Hop! 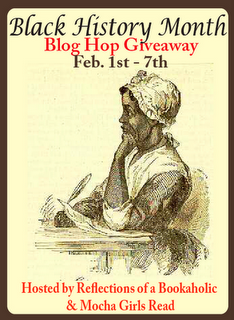 Welcome to the Black History Month Giveaway Hop hosted Hosted by Reflections of a Bookaholic & Mocha Girls Read. This hop runs from Feb. 1-7. For this hop, I’m giving away a copy of The Red Pyramid by Rick Riordan. I love young adult novels and The Red Pyramid features biracial siblings and Egyptian mythology. I really liked this book and you can read my review here. My giveaway of a copy of Living Violet, an awesome paranormal YA novel by the fabulous African-American author Jaime Reed is also still open. Just click here to enter. For the Black History Month Giveaway, follow the Rafflecopter instructions for the form below and good luck! Great giveaway! I love me some Rick Riordan. Also, I know you didn't make the button for the hop, but can I just say that it warms my hear to see Phyllis Wheatley on it? Her poetry is so underrated. Just saying. Awesome giveaway - I've entered but don't use GFC - I do subscribe to your RSS though. The Red Pyramid looks good. Happy New Year and my Bookish Resolutions!